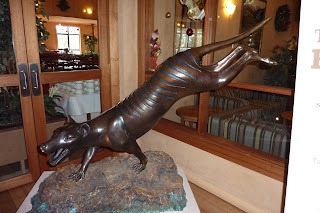 On Sunday, I headed to a resort to something called the "Wilderness Gallery." I'd seen billboards and brochures advertising a Tasmanian tiger exhibit. 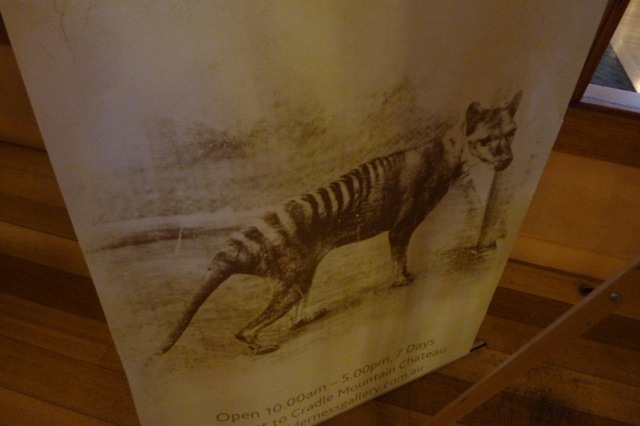 And I love me some Tasmanian tigers. The first time Turbo the Aussie told me about Tasmanian tigers, I accused him of bullshitting me. He was always saying silly things, and I barely believed him about the giant-sized kangaroos and emus that had once inhabited Australia (these mega-fauna were confirmed by a museum in Queensland within the month). Why would I believe there had been a tiger in Tasmania? I remember going to the slow, rural dial-up Internet in Crystal Creek, NSW, to search for proof that Turbo wasn't putting me on. Huh. He hadn't been lying to me. There really had been an animal commonly called the Tasmanian tiger. And European settlers in Tasmania had driven it to extinction in the 1930s. Because that's the kind of folks they were. Our madman tour guide recommended the Wilderness Gallery, and was excited enough about my interest in Tasmanian tigers to drive me to the venue and drop me off before taking the rest of our group of 17 tourists hiking. Apparently they were rained on while I was inside browsing, but I didn't notice. Opening time was ten a.m., so I had nearly two hours to slowly sip a flat white (called a "regular" in New York, or a coffee with milk and sugar in other US cities) in the resort cafe while waiting. Fortunately, the wifi keep me busy. Sixteen dollars for 24 hours of Internet seemed like a bargain given that it was $10 for one hour at the caravan park my group had stayed at. Admission was seven dollars and the exhibit was informative but depressing. (No photos were allowed of the photos, displays, and tiger skins.) The Tasmanian tiger had been blamed with excessive killing of livestock, perhaps unfairly so as domestic dogs held a share of the guilt. Fearing what they didn't understand, people trapped and killed the tiger as they also did the Tassie devil back then, and a bounty was offered for bringing in tiger tails. The last Tasmanian tiger was alone in a zoo in the thirties, where he died, the last of his species. I remember a news story that the Tassie tiger DNA had been extracted a few years ago. Maybe they can make a new one. "I've seen four of the in my time," he started up when the other old men on his bus stopped near him to wait for their guide. They all nodded sagely. 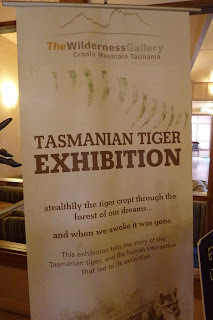 They probably had their own stories of seeing glimpses of Tasmanian tigers. "He was gone in a flash...but I saw the stripes and the tail."